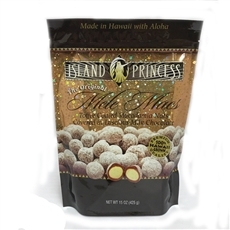 Island Princess Hawaii's world-famous Mele Macs are Whole Hawaiian Macadamia Nuts, covered in rich toffee, drenched in luscious milk chocolate, finished with a sweet dusting of powdered sugar. 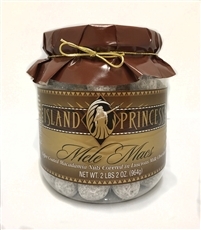 This unique candy, Mele Macs, is the signature gourmet chocolate of Island Princess Hawaii. Packaged in a variety of gift presentations: in gift baskets, jars, gift boxes, and snack bags. All made in Hawaii. Mini Meles deliver the same big taste with Macadamia Nut halves.